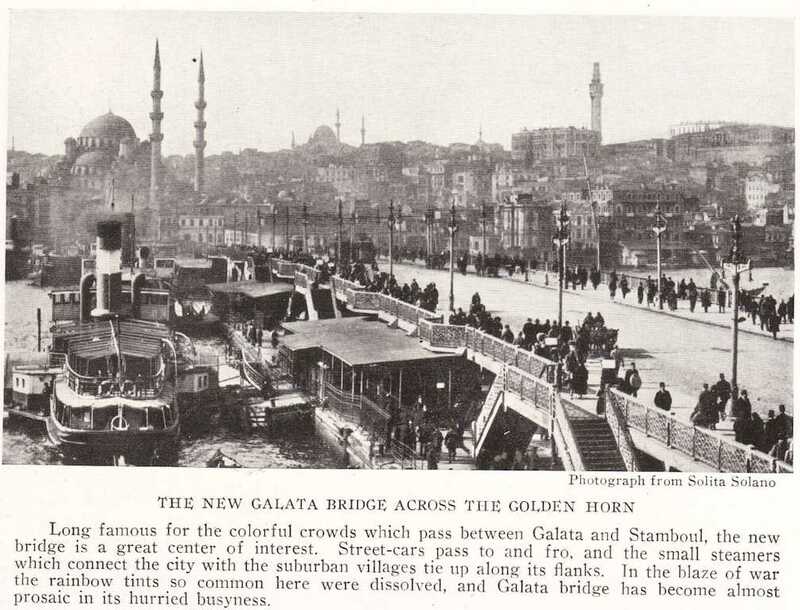 Galata Bridge which is connected with two sides of Golden Horn (Haliç in Turkish) is located between Eminönü and Karaköy, districts of Istanbul. Its building story is based on the Byzantine Era; Byzantine historians claimed the first bridge on Haliç was built the period of Justinianus I in 6th century. It is estimated that named as ‘’ Aghios Khalinikos Bridge’’, with 12 arches stone bridge was situated between Eyüp and Sütlüce in Istanbul. 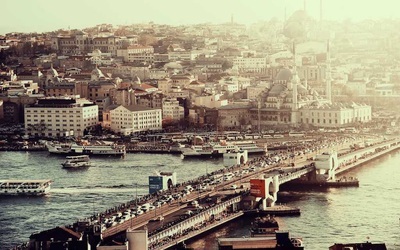 After the conquest of Istanbul in 1453, Fatih Sultan Mehmet the Conqueror established a mobile bridge placed between Ayvansaray and Kasımpasha (cities of Istanbul) to pass his army the other side from here. In 16th century, the period of Sultan Bayezid II (1468-1512) invited famous artist Leonardo da Vinci, born in the town of Vinci in the region of Florence to Istanbul to construct a bridge linking Eminönü to Karaköy. After Leonardo had decided to come to Istanbul to establish the bridge, he was later dissuaded from that project by the administration of the time. It is figured out from letters in the Topkapı Palace today that there was an action of Leonardo da Vinci on this head. The bridge building project of Leonardo da Vinci on the Golden Horn was completed in Norway in 2000s. Moreover, there were plans of another bridge project to be built on this site by great artist Michelangelo. 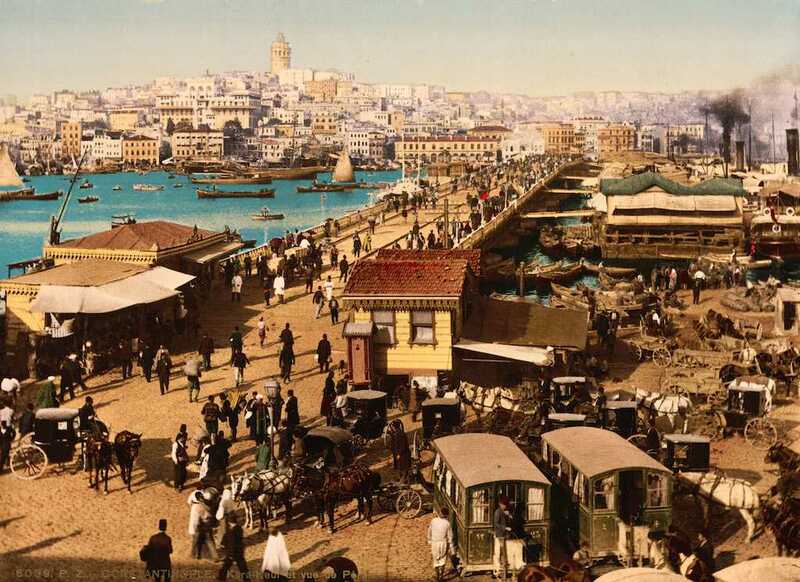 In 19th century, 1836 named as ‘’ Hayratiye’’, ‘’Cisr-i Atik’’ and ‘’Old Bridge’’, that long bridge was made by the order of Ottoman Sultan Mahmut II (1808-1839). 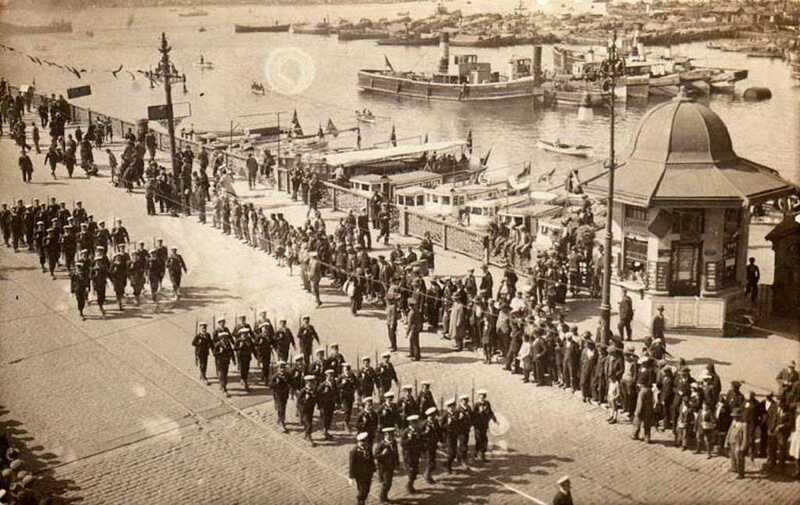 The plan of that structure was organised by Admiral Fevzi Ahmet Pasha and his workers by being used tools of marine shipyard. But that building which was approximately 500-540 meters in long was demolished in 1912. In 1845, the time of Ottoman Sultan Abdulmecit, the first modern Galata Bridge was built by his mother, Valide Sultan. Called many different names such as ‘’ Cisr-I Cedid’’, ‘’Valide Bridge’’, ‘’New Bridge’’, ‘’Big Bridge’’, ‘’New Mosque Bridge’’and ‘’ Güvercinli Bridge’’, that wooden construction could stand for 18 years. 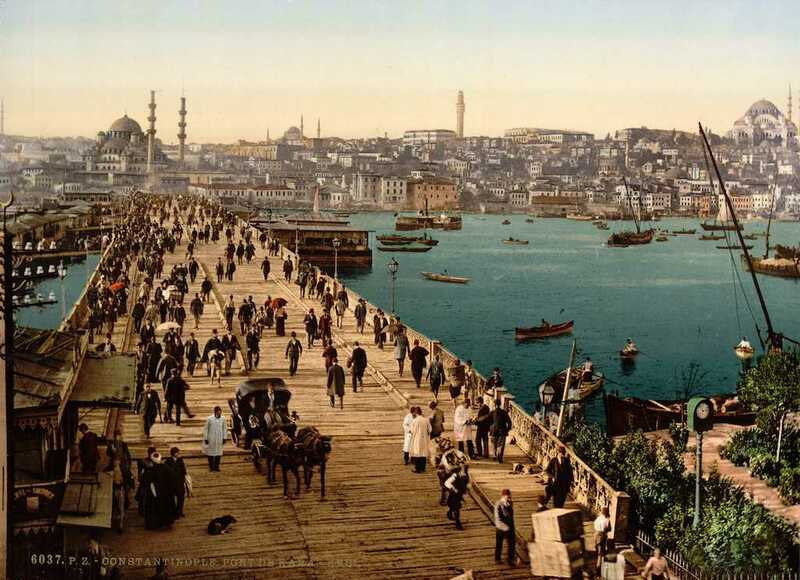 In 1863, the second modern bridge was constructed by Ethem Pertev Pasha by the order of Sultan Abdulaziz, before Napoleon III, famed Emperor of France came to Istanbul. The project of third modern structure was given to an English Company ‘’G.Wells’’ and it was completed by that company in 1875. That new building which was 480 meters in long and 14 meters in wide was used until in 1912. Also, the fourth modern building was built by German Company MAN AG in 1912. But in 1992 that fascinating structure was damaged in a fire. After the fire, building of the new bridge was swiftly started, and it was opened on the place of the old bridge in June 1992. Consisted of of 11 plaques, the unique pieces of the old bridge were inserted on the site in the Karaköy district, and the undamaged parts of the construction were moved and located on the foot in the Atatürk Bridge found in the Unkapanı district. 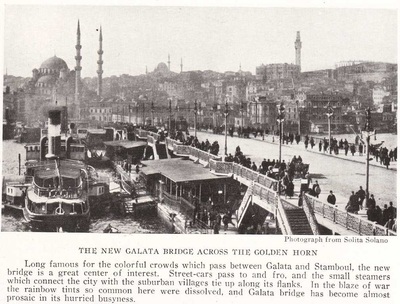 The Galata Bridge was highly protected against fire. Therefore, smoking was banned not to be burn the wood platform of the bridge during day time. 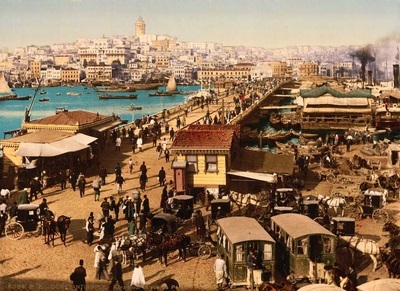 It was known that the bridge was servicing pedestrians and carriages for hire, so a customary charge named müruriye started. 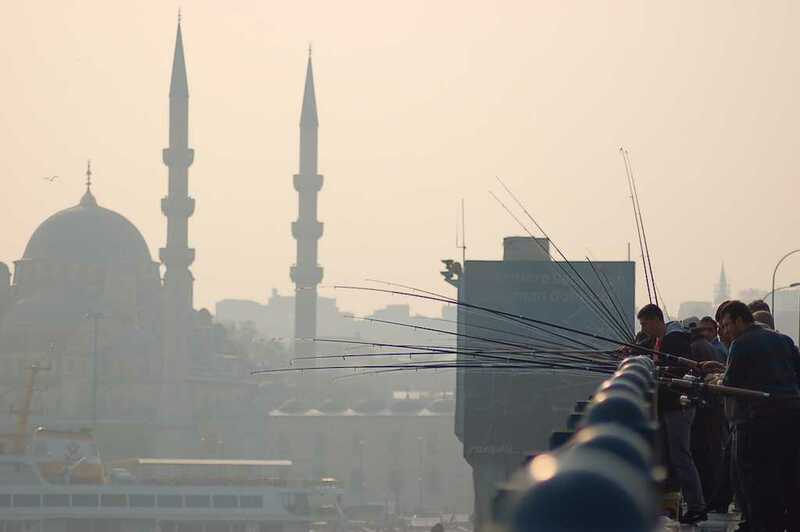 The Galata Bridge is not only an architectural beauty, but it is also symbolizes a poetic image the lifestyle of the people of Istanbul.